Rain or shine, Rush Creek Golf Club is a buzz during the summer with kids of all ages. 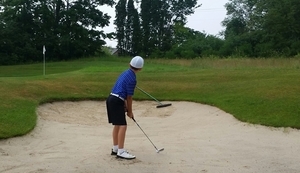 The junior programs teach swing fundamentals, rules etiquette and safety during week long camps. high school golf at Wayzata, led the Trojans to the MSHSL Class AAA state championship in 2013 and captured the 2013 individual class AAA state title with a 6-under 140 as a junior. During the summer, Burnham works on her game at her home course and loves the opportunity Rush Creek gives the younger kids. 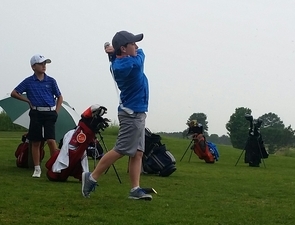 For PGA Director of Instruction Aaron Jacobson, watching the progress of kids in the program is fun to watch. Burnham, the Big Ten Conference player of the year, started playing at Rush Creek with her father. Although it took a while to fall in love with the game, she began to hit better shots and make more putts and by her seventh-grade year, began to blossom. “Golf can be frustrating sometimes, but if you keep trying and trying until you get it you are going to realize how hard work really pays off and how fun it feels when it does pay off,” Burnham said. For more information on Rush Creek Junior Summer Camps, click here.